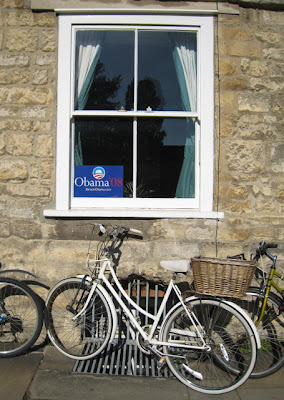 Are they marketing to expats in Oxford or Americanophiles? I feel more American living abroad. It happens every time I open my mouth. It doesn’t matter that I’m wearing a battered Barbour and muddy wellies or even that my husband is English. My accent declares that I’m not British. We Americans grow up with a sense of England from watching Masterpiece Theater on public television. We expect Oxford to be just like Evelyn Waugh’s Brideshead Revisited, forgetting that it’s fiction and from another era. In the two decades I have visited and occasionally lived in England, I’ve seen a great deal of convergence between our countries. There was the spread of first McDonalds and the GAP and now Starbucks etc. I wouldn’t call this a good trend, but my kids appreciate the super-sized “American cookies” (instead of “biscuits”) at train stations. A "coffee Americana" in Europe is what we could call "coffee black." I am happy to find bagels in the supermarkets now even if they taste more like bread. My first homesick year living in London (1980’s) I actually called the American Embassy to ask where to buy bagels. They didn’t know. My fiancé found them in Leicester Square, and later I discovered a Jewish area in Brick Lane. My notion of England must sound warped to British ears, and British concepts of America sound just as funny to me. 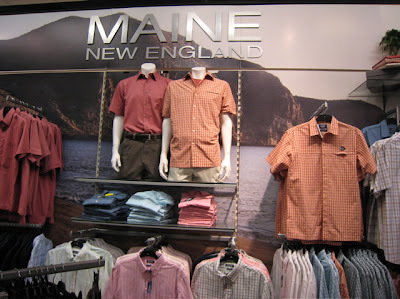 In the very English department store Debenhams I found this display of “Maine New England” clothing. Where can I start? I have never seen landscape like that in my home state. I’m guessing the photo was shot in Cornwall, not in Maine. The pink-red shirt color is native to New England, but it’s called "Nantucket Red." It’s popular with sailors and preppies on an island in Massachusetts. Button-down, short sleeve shirts are much more prevalent in England than in the USA. One advantage of living abroad during an election year is to have a filter from all the frenzy. I check the primary results in The New York Times on line and see the race covered by the English media. I’ve been less than impressed. Mary Dejevsky’s commentary in The Independent was typical of the English coverage, and I’m sure there are American equivalents. Too many articles focus on race vs. gender when discussing Barack Obama and Hillary Clinton. Of course that is a key issue, but I find it demeaning to the candidates to reduce them to inherited characteristics. There are clear policy differences between Clinton and Obama. Living under the National Health in England is bliss: no insurance forms or co-pays and everyone is covered. I can admire Clinton for wanting that for our nation. Then there’s the war. The British are very concerned about the War in Iraq, and yet they seem unaware that Obama has opposed the war since day one, without waffling, whereas Clinton voted for it before doing an about face. Obama is a fascinating candidate for reasons that go beyond race. I’m reading his incredibly well written memoir Dreams of My Father. I found it prominently displayed at Paddington Train Station. The most compelling article I’ve read on Obama was by Andrew Sullivan in the Atlantic Monthly. Sullivan is British and Oxford educated but lives in the USA. If you read only one article about Obama, read that one to understand the political culture and the meaning of his candidacy. You can buy American magazines in England, but they cost as much as books. This one was worth it. Walking through Oxford, I found this sign in a dorm room window. I’m guessing there’s a Rhodes or Marshall scholar in residence. President Bill Clinton was one himself, but I haven’t seen any Clinton signs for his wife. Ironically, I believe this window is at Univ, Bill’s college at Oxford. Another memoir I’m reading is Rosa Ehrenreich’s A Garden of Paper Flowers about her time as a Marshall Scholar at Oxford. I can’t say I’m enjoying it. It’s a very subjective and whiny account that plays to stereotype: the American can’t fit in with the rigid, class-bound Brits. Her naivety is almost humorous. She chose Christ Church and then complains that it was too upper class and religious, when even a spot of research could have told her that. Ehrenreich finds fault in the Oxford system compared to Harvard without realizing that she’s comparing undergraduate education to a graduate program. Of course graduate education in political science is going to be more theoretical, narrow and full of jargon. It’s a big part of the reason why I left academia myself. It is much more fun being an undergraduate, especially in the American system. I took elective courses in music, forestry, literature and art history while studying politics. English students enjoy their undergraduate years too. Like Ehrenreich, my husband had fun rowing, but he also received a first rate education at Oxford and then at Harvard. Henry appreciated both despite their differences. Ehrenreich does do a good job describing what it feels like being a confused ex-pat American at Oxford. Her personal reactions will help guide character development in my third novel. I’ve also talked to my cousin Peter Nohrnberg, who was another Marshall Scholar but at Magdalen College. I have 3 American friends who very much enjoyed their junior year at Oxford. I studied abroad during my junior year too but at King’s College London. Last time I lived in England (2004), my husband was leading Colby-Bowdoin-Bates semester in London for Maine college students. This academic year Henry is doing a research fellowship at Oxford for his sabbatical while I'm researching my third novel. My work in progress places an American student at Oxford in the 1980’s and now. The true experience probably falls somewhere between my good years and Ehrenreich’s misery. If there is misery, I’d like to find the humor in it as well. There is nothing like living abroad to give insight on a foreign culture but also on one’s own. We see ourselves in another’s eyes better than by looking in a mirror. If you know of other books (fact or fiction) about Americans at Oxford, please comment below. I’d also love to hear some personal accounts. You can comment anonymously. In case you were worried after my last post, the flood waters have receded. The sun has been shining for days! The crocuses are blooming through the muck, but there's snow/rain in the forecast. It's just like late mud season in Maine. Doesn’t this photo (click image to expand) look like an oil painting? It’s the digital zoom and the winter light. First of all, Sarah, your photography is *gorgeous*. 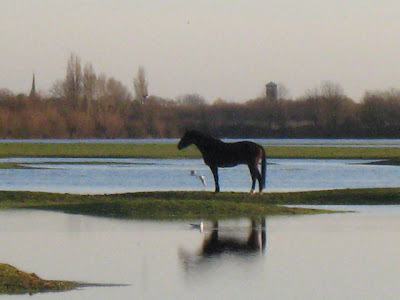 You should consider doing a coffee-table book of photos of Port Meadow through the seasons. Or maybe just use them to make your own calendar to give as gifts for 2009. I actually like a lot of the BritPress coverage of the US elections. But then, I'm not a very political animal. Back in the States I avoided political stories, the result being that I, um, didn't know much about what's going on. But the stories in the Guardian and elsewhere are more basic, not expecting the (primarily British) readers to know the ins and outs of US campaigning. Thus I can get up to speed. And it is amazing to see the space and energy devoted to the race, an indicator of how much the US occupies the global mindset. Ruth, thanks that book sounds interesting. Despite convergence, there are certainly aspects of Britain that remain the same, both good and bad. John, you are right that the British press should be complimented for putting so much effort into understanding another nation’s politics. There is a range of quality in the journalism, just as there is back home. Hi, just discovered your blog today and was really interested in your take on the British press's coverage of the Clinton/Obama race, as it could feasibly be billed. You are right, there's so much weight put on the fact that it's a black person v a woman. As a black woman, I'd rather read more about their policy differences. Beyond that, I was fascinated to read what you wrote about being an American at Oxford and more generally studying abroad. I also studied at Kings College London and as part of that enjoyed a year in Martinique. I remember very clearly thinking that everyone who is able should spend a significant amount of time as a foreigner. It will be increasingly important in these times of immigration monitoring and multiculturalism. As someone who is half Jamaican and half Nigerian by birth but born in England, I find the subject fascinating! On the American accent... How funny to move to another country and suddenly find yourself more than ever representing your nationality, identified by it, tied to it. As an American living in S. Oxon with two very British sounding children, I am always amused to be spotted- the American lady. Still in the most positive way, the "reserved" English feel more free to chat about their travels to the US and to offer their own most scathing criticisms of local habits and climates. When living in the US, I never feel especially attached to my nationality, perhaps even the opposite. Nationality feels like a crude blanket tossed over those ever important subtleties of character, yet when living outside that nation one suddenly has the marvelous power to represent a whole country. I am definitely enjoying living in England, happy to be a bit of an outsider looking in ...both directions. The discovery of bagels in Brick Lane has been a great help in becoming fully acclimatized. What a small world made even smaller in cyberspace! I wonder if we were at King’s together in 1989. I was very impressed by the English tutorial system. It was the best way to read philosophy. A year abroad in Martinique sounds like fun. And Soxon, your experience matches mine. 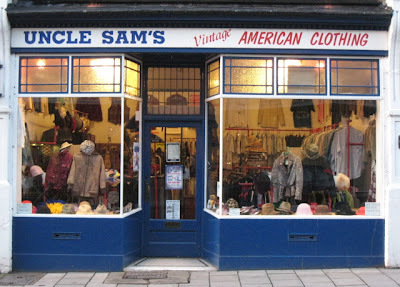 In London the local shop keepers were thrilled to have an American in the community and were extra friendly to me. I missed feeling special when I went back to the USA. I’m a big supporter of study abroad programs, having participated in 3 programs as a student. After college I managed a program that placed foreign students in American high schools/home stays for a year. I agree that living abroad is key to understanding our increasingly multicultural society. I’d go so far as to say that many of the US’s problems in foreign policy stem from its insularity. This is a very interesting post, Sarah, and makes me want to read your novel when it's done (or in draft form, for even more fun!). Our family only arrived in Oxford, from Texas, two weeks ago, so we're still adjusting. Maybe we'll "still" be adjusting by the end of June when we return stateside. Like you, I notice a lot of interest in the American elections over here. People--not just academics--even know the Mike Huckabees and Ron Pauls of the campaign, which I find fascinating. When I've talked to Brits about our primary election season, I've wondered if I detected a bit of a tone that calls to mind the way a big brother would have interest in his little brother--curious, yes, but with an awareness of who the big brother is. Though I wasn't here decades ago (let along longer ago! ), some of the aspects of economic globalization here are striking, and I appreciated that part of your post as well. Walking along Cornmarket today, for example, must be a very different experience than it was decades or centuries ago. Today, there are shops for mobile phones (Orange, T-Mobile, Vodafone), and The Gap is there, as is Starbucks, and a KFC (!) and a Burger King. There are distinctive shops, too, but presumably not as many as there were years, decades, or centuries ago. It makes me wonder if this beautiful street is less unique than it used to be. After all, we can visit a T-Mobile store anywhere. This isn't just happening in Oxford, obviously. Globalization is everywhere. Among the biggest and most prominent stores on Harvard Square, after all, is a Banana Republic. Welcome to Oxford, Paul! I’m sure your family will have a memorable year. Those first weeks of settling in are the hardest. You expect everything to be similar due to the common language and globalization, but England is quite different from the USA. That’s the fun of it. Paul's point about all the chain stores is a good one. When I lived in Oxford in the 1980s Cornmarket and Queen St were full of characterless chain stores too, just different ones - all shoe shops and insurance companies as I recall. I suspect the Town Planners decided to put all the ugly shops in one or two streets so that the rest of Oxford (eg the HIgh ST) retained its charm. It's the same principle as the "green belt". Sarah's gorgeous photos of the countryside are often just a few hundred yards away from the town center. Another difference to America I suppose: the Brits do a much better job of town planning and avoiding surburban sprawl. I am still shocked that the lovely Charles River in Cambridge Mass. is flanked on both sides by 3-lane highways! Sarah, in my first few weeks here in Oxford my eyes have been drawn to those "signs" of America(Starbucks, Gap and McDonalds) and I can pick up American accents across a crowded room. I think I'm looking for what I know, even though it's not really the same. (I've yet to darken the door of any of these establishements, although I can imagine a day when I might.) I didn't think I would have a homesickness for the homeland, and it's not really that. It's more like seeking comfort, finding something that shouts, "You belong. You are one of us." Professor Laurence, who you most likely just call Henry, asked me to check out your latest post. I'm new to the blog world and have certainly never posted, but I'm going to give it a shot. I am currently living in Madrid. I've been living here since September and have lived here previously. I agree with you that I have never felt more American than this year abroad. I don't generally consider myself very patriotic. Being an Chinese American and growing up in NYC, surrounded by a plethora of different cultures, I never felt that I had anything in common with the conservative, hamburger loving, gun-nut that people associate with America. Not only is it obvious that I'm not Spanish, no matter how much I might try to assimilate (of which I make absolutely no effort) my ethnic exterior and american accented spanish will always give me away. After being viewed and treated like an outsider, I realized that I am nothing else but American. Throughout my travels around Europe, I've come to appreciate, love, and miss the life I had. I have a higher standard of living in NY and Bowdoin than here in Spain. It is the little things that make the difference. One of my biggest problems with Spain are the pillows. They're the standard European pillow, being extremely flat, polyester filled, and insupportive. The pillowcases are also opened on both ends, so that shaking/jiggling method to get your pillowcase on only works so well. One of my first trips when arriving in Spain was to Edinburgh where I bought myself a pillow. Food is one of things I miss most. All American food products are catered to their spanish tastebuds leaving my american ones remeniscent of a true brownie, or plate of spaghetti. After two years of the 4-week cycle menu of Bowdoin food. I find myself looking at my widgets board for the daily meals at each of the two dining halls, Thorne and Moulton. My favorite being the cajun glazed meatloaf with salsa mashed potatoes served on every 4th Friday at Thorne for lunch. The education system in Spain is also different. It is exactly how you would imagine the country that is home to the siesta to run their universities. I take classes at the political science school at the University of Complutense, one of Spain's biggest public universities. I find it odd that the professors prohibit eating and yawning in class, but are totally fine with students smoking joints right outside the classroom door (still indoors). The students drink alcoholic beverages and leave their cans, glasses, and bottles laying around hallways. Cheating and plagiarism are the norm. Class attendance is pretty much non-existant. My favorite part: libraries are normally only open from Mondays to Fridays during normal work hours 9:00 - 18:00. Ha, at least those don't shut down and take a 2.5 hrs lunch break. I agree that the English do a great job of controlling sprawl and protecting farm land. Villages still feel like villages often surrounded by farmland that include public rights of way so that the public can enjoy the open space. Wolvercote feels so rural despite being in Oxford. Deb, after a while you get used to being the foreigner. The experience gives a whole new perspective on the world. I now have extra empathy for the many immigrants who live in the USA. Helen, welcome to the blog world! I can understand your frustrations. The first time living abroad is not easy, especially after Bowdoin, which does such a great job of looking after students. I’ve only once been to Spain and was impressed by the nightlife. Mediterranean countries revolve around siestas so you need to readjust your biological clock. I bet you’ll come back home craving tapas. Thanks everyone! I’m finding this so interesting, this dialogue over living abroad. I know that it didn't take place at Oxford, but as a someone born in 1980 who wasn't old enough to enjoy them, I loved the movie Starter for 10. It stars James McAvoy, and a few other relatively unknown but wonderful British actors. My fiance was a Rhodes Scholar in the late 80's, and I loved this little window into his experience. Hello Sarah, Oxford enthusiasts and fellow Yanks! What is NOT CRICKET about? I'm currently writing a memoir about my junior year, studying English at Oxford. I have yet to settle on a title, but 'American at Oxford' will likely factor in somewhere. I have ordered the aforementioned books (Paper Flowers, These Ruins). Are there any others out there? I haven't found any yet. I began writing before I knew about those two. Although, from what I've gathered, my book will be quite different in all but setting. Anonymous, thanks for the movie recommendation. Arielle, welcome to my blog! Don’t worry too much about the title as the publisher will have last say on it. There is a collection of student essays on being at Oxford in the 1980’s called The Oxford Myth (1988) edited by Rachel Johnson. Since I’m writing fiction, I draw more from my personal experience and my imagination instead of research. I’d be interested in hearing what you find so please do post another comment if you dig up mores sources. I’ve only written the prologue of NOT CRICKET although the characters and plot line are forming in my head. It will be about 2 generations of American women at Oxford and will revolve around a moral dilemma. “That’s not cricket” is an English expression meaning not playing by the rules of gentlemanly conduct. The central male character is captain of his college cricket team at Oxford, but the book isn’t really about cricket. It’s more about the differences and attractions between Americans and Brits. Cricket is so English, but Americans don’t get it. Good luck with your memoir! I know this post is quite old, but Im considering applying to Oxford (Im from California) for my Phd and it was very interesting to read all this. Just wanted to say hi and thanks. Or click on the link in my sidebar. Expat tips for Sabbatical in England should be especially helpful. Thanks for your kind words on my blog and yes I am definitely going to apply and will definitely read all your posts seeing that I am having a bout of obsessive-compulsiveness regarding Oxford haha. I know this is really old, but I was wondering if there were any advantages/disadvantages being American and applying to Oxford. Anonymous, I've heard that it is harder to get into Oxford as an American for an undergraduate degree. There are study junior year abroad programs for Americans run through US organizations although I don't know much about them. I've also known Americans who did a graduate degree at Oxford.